A good example of housing development along Gardeners Road Alexandria, built right to the footpath. Balconies and major living space face the street where possibly more than 60,000 vehicles pass by every day. 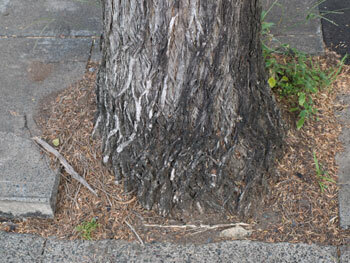 It is the same along many other main roads, including in the Inner West Council municipality. The article says that it makes sense to build housing close to public transport, but building high-rise housing along busy roads exposes those people to traffic pollution to the detriment of their health. The former Department of Planning has a 9-year-old interim guideline titled ‘Development near rail corridors & busy roads to help development limit harmful exposure to air pollution. Locally high-rise buildings are built right to the footpath, instead of building away from the footpath & putting in a line of trees to make the air quality better for residents. The stepping back of building facades is being suggested in planning documents for the Sydenham to Bankstown Corridor in a bid to lower the impact of an eight storey building being built next to single storey houses. The location of living areas, outdoor space and bedrooms … should be as far as practicable from the major source of air pollution.” If you look, the majority of high-rise developments have balconies that face the street & are attached to living rooms, so this suggestion is obviously not working. The interim guideline also says, “… it is preferable if residential uses are not carried out along a busy road unless it is part of a development which includes adequate noise and air quality mitigation. So we know that the government at all levels & developers know that the way they are developing Sydney & other major Australian cities is not good for us & will have serious negative health impacts. Just how these residents will adjust to living 1.4 metres away from more than 50,000 plus passing vehicles every day is anyone’s guess. “…..the Sydney Motorway Corporation, RMS and contractors have canvassed the possibility of installing noise insulation, sealing wall vents and installing airconditioning units in apartments that will jut up against the seven-lane road.” So, use your balcony at your own risk then? Even prisoners in gaol get access to fresh air from their cells. Tonight the Joint Regional Planning Panel (JRPP) met at Marrickville Town Hall to consider the DA for the old Marrickville RSL site. Well, they did approve it (unanimously) despite around 100 people from the community attending & 12 people, including Clr Kontellis, Clr O’Sullivan speaking at length about what they believed were the problems of this development. I also addressed the Panel. There were many arguments from the community including that the proposed building was ugly, inappropriately big, greedy, non-green & insensitive to the locality. The Panel members were Clr Macri, Mr Ken Hawke, Mr John Roseth, Ms Mary-Lynne Taylor & Mr David Furlong. The following is how I understood the meeting & all mistakes are mine. The developer advertising the units before approval by the JRPP was noted, seen as ‘unfortunate,’ but did not influence the Panel. Essentially, why would the JRPP knock back a 7 storey development when Illawarra Road & Marrickville Road is about to be developed with 5-6-9 & 13 storey buildings? The Architect spoke about his cultural background, that he grew up in Campsie, danced at the Marrickville Town Hall when he was younger & was an award winning Architect. He said along the following lines, I designed the Lamia development & am extremely proud of that. 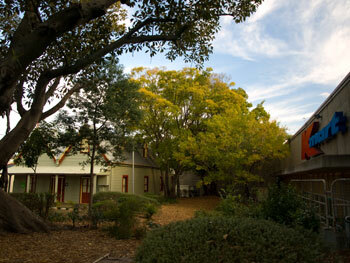 It was refused by Marrickville Council & has won an architecture award. People were complaining about that. I’m not shy about landing a big building in Marrickville as it can do an enormous amount of environmental good. It’s called urban consolidation. He said he had 25 more points (I would guess they were issues brought up by the residents to address), but decided not to, asking the Panel if they had any questions for him. They had 3. 1. Why is the building so high? A: We have a mandate to work within what is already presently there. 7 storeys is a significant offering to the street. There is an enormous amount of amenity in buildings these days. Hollowing out the centre does this. High is an appropriate form. Marrickville Town Hall has enormous height. Any building next to a railway should be a public building. 2. Why haven’t you included solar panels? 3. Had you considered a green roof? So there you have it. The local people at the meeting left angry. I feel very sad. 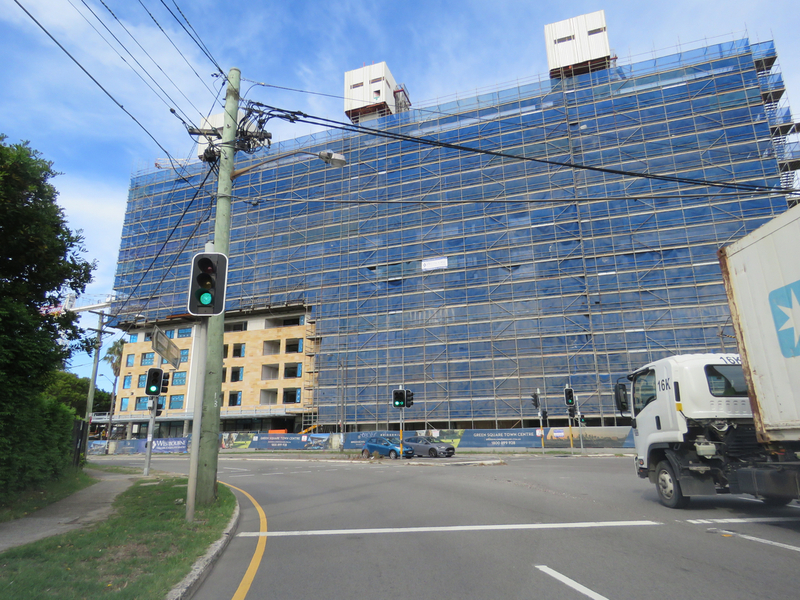 This building is just the start of high-rise development in Marrickville town centre. The only building that I have heard discussed as having green requirements, is the Marrickville Hospital site. I can only hope that the new Local Environment Plan includes green building & sustainability such as green roof, green walls, solar power, decent sized trees & green space as a mandate. I am posting this separately from the full Report from the Gallery because of the Public Meeting about the Marrickville Metro expansion tonight. The following is my understanding of the discussion & all mistakes are mine. The Public Meeting is to be held at tonight Wednesday 21st July 2010 at 7pm at St Peters Town Hall, 39 Unwins Bridge Road Sydenham. Request for extension of time for community submissions concerning the DA for Marrickville Metro expansion – 2 residents spoke asking that instead of the usual 30 days given for submissions, that this be extended to at least 60 days. They said AMP has had masses of time to get themselves organized & that most of the nearby residents are not aware of the planned expansion. They said there is not much information about the expansion on the Marrickville Metro website, that supposed door-knocking & letter drops by Elton Consulting to the residents has not been successful in that most don’t know what is happening. They also spoke about current problems of traffic, 4am deliveries & maintenance, staff parking in the streets & noise. Clr Hanna put up the motion to have the consultation period extended to 60 days. He spoke about being blocked for 15 minutes while a Woolworths truck was doing deliveries. He said none of the residents know what is happening & there are a lot of complaints about Metro as it is currently. He said to make it double the size & buy the street is going to create major problems & asked where the 700 new staff are expected to park. Clr Phillips put up an amendment that Council is to write to the Minister to hand the assessment of the DA back to Marrickville Council. He said the expanded Metro would be a disaster, that it would hurt our shopping strips & cause problems with parking. He said AMP want a privatized space where there is no infrastructure & the process allows a limited scope for consultation. Clr Thanos supported the 60 day consultation period. He said the planning process has been the most disgraceful process he has come across & it looks like a deal has been made with the state government with AMP as the beneficiary. Mayor Iskandar said Council was preparing everything to oppose the expansion & the shopping strips will suffer, but the law is as it is. He said we will fight the process together, but shouldn’t raise false hopes. Clr Marcri said parking does not exist for local shopping strips so people drive on to Metro & the shopping strips cannot compete with this. He also said the local streets near Metro have been earmarked as parking for the new Enmore pool & that if Metro expands, there will be a huge gridlock further out & residents will suffer. Clr Byrne said if the Metro DA is passed, the state government Department of Planning will not be following fundamental planning processes as Council has been told they cannot change the zoning in this area. Carried unanimously. What I did notice was that no-one mentioned the many, many trees that will need to be removed if the expansion goes ahead. The community now will have 60 days to put submissions in regarding the Marrickville Metro expansion & they will do this with the knowledge that all Councillors oppose the expansion. Hallelujah! Hope to see you there tonight. This post has nothing to do with trees, but I believe it is of interest in light of the fact that Marrickville LGA is about to undergo quite substantial high-rise development. In 2002 Council decided to create a new rate of ‘rates’ to apply to large shopping centres like Marrickville Metro. It charged Marrickville Metro the new ‘rate,’ higher than the rate that applies to homes & smaller businesses. The company paid the new rate each year, but in 2008 objected & took the case to the Land & Environment Court. The court ruled in Marrickville Council’s favour. The company appealed to the NSW Court of Appeal. It argued the new rate should be overruled on a raft of grounds such as: Council had failed to comply with various sections of the Local Government Act, the rate was unfair, the rate was targeting only one site (Marrickville Metro), the 2002 & subsequent decisions about the new rate were manifestly unreasonable, the rate was imposed for improper purpose, the rate was discriminatory, some Councillors who voted in favour of the rate were biased. Larger shopping centres may attract additional traffic to the LGA & may concentrate traffic emanating from within the LGA placing a proportionately greater pressure on existing road & footpath infrastructure than other shopping configurations. Larger shopping centres attract larger retailers who are more likely to draw from a wider employment pool than that available within the LGA. Small shops along shopping strips & local businesses may be more likely to employ local staff enhancing local employment & local economic prosperity. – Access for the elderly to shopping facilities particularly where car transport is not available. This is a landmark decision. Well done Marrickville Council. Businesses & developments are getting bigger & bigger, bringing increasing pressure on public infrastructure & impacts on the community that Council ultimately needs to pay for. It would be nice if the JRPP keep the above points in the General Manager’s report at the forefront of their mind when considering applications for new large developments. AMP, which owns Marrickville Metro, plans to expand the shopping complex by 35,000 sq mts, more than doubling its size. They intend to bypass planning restrictions from Marrickville Council & apply to the Joint Regional Planning Panel under Part 3A. In my opinion it is highly likely that the plan will get the go ahead from the JRPP, as they seem happy to permit development that local Councils have indicated they are likely to refuse. The Marrickville Greens are opposed to the proposed expansion of Marrickville Metro & you can read what they think about the issue by clicking on this link – http://marrickvillegreens.wordpress.com/issue/marrickville-metro-expansion/ I am unaware what Marrickville Labor or the Independent Councillors think about the proposed expansion. This is a seriously big Fig with a girth of many metres. 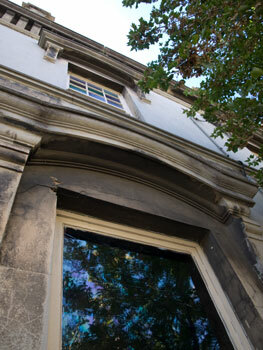 It stands near the front entrance on Victoria Road. Apart from the obvious impact this development will have on our local shopping strips & issues like increased traffic, pollution & delivery trucks, SoT’s main concern is the probable loss of all the mature trees which surround the Metro site & all the mature Eucalypts which line the surrounding roads. 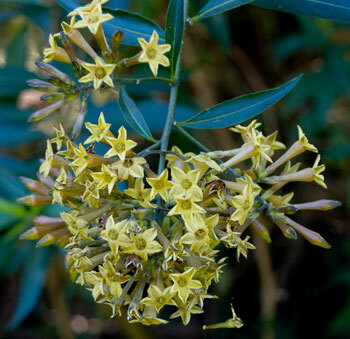 Around the perimeter of the current Marrickville Metro there are 54 Figs, 13 Brushbox, 3 Camphor laurels, 1 Peppercorn, 1 Palm. 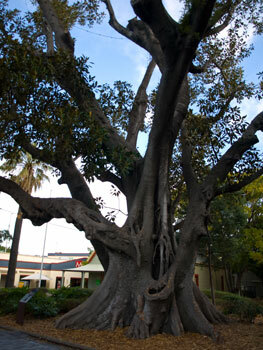 There are 11 mature Eucalypts on Smidmore Street. This is a total of 83 mature trees & I did not include the smaller trees. 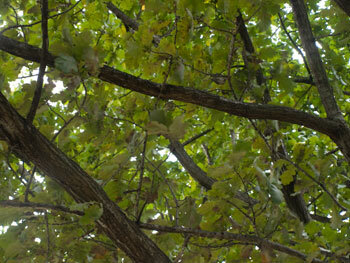 Looking at the drawing of the new Metro on AMPs web-site I would consider all these trees at risk of removal. The artist’s impression of what the finished development will look like is interesting. The drawing of the new Metro shows 3 London Plane trees & lots of paving. Personally, I don’t want a bigger Metro. Two supermarkets are enough for me. I definitely do not want all those trees chopped down. I believe that for the Inner West we need the opposite to concentration of large volumes of traffic towards 1 block of land. A sustainable inner Sydney needs shopping strips near where people live as opposed to being forced to use their car & travel for kilometres each time they go shopping.